Once again, it’s time for “images through their eyes.” This time from our recent tour to Italy. I think you will be amazed at the quality of the photographers on this trip! Remember to click on the links to view more of their fine work. Enjoy! 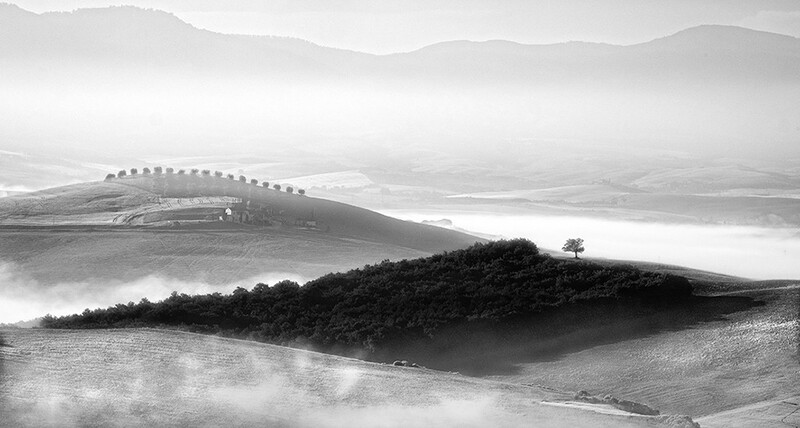 Barry Wolf – Belvedere: We had gone to Belvedere the previous morning but there was neither any fog nor nice light. We decided to return the following morning because the weather forecast was favorable for fog. The forecast was accurate because we were greeted by fog everywhere. It was one of those magical mornings that you hope for and was an experience that I’ll never forget not only because of the location but the great group that I was with. 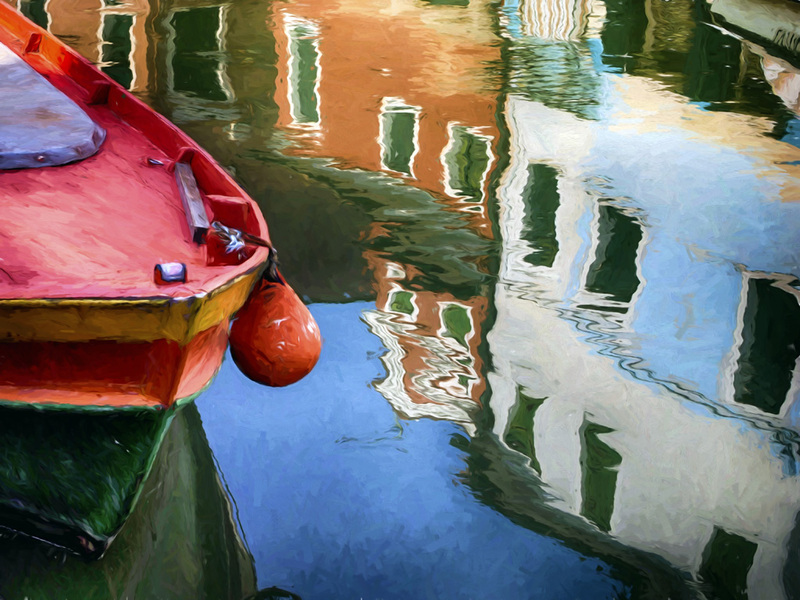 Laurie McCormick – This is one of my favorite images because I love color, reflections and capturing the essence of place. ‘Life in Burano’ I believe has all three ingredients and gives the viewer a small peek into the lifestyle of the people who live on the Island of Burano, Veneto Italy. Facebook Check out Laurie’s National Geographic “Your shot” gallery here too! 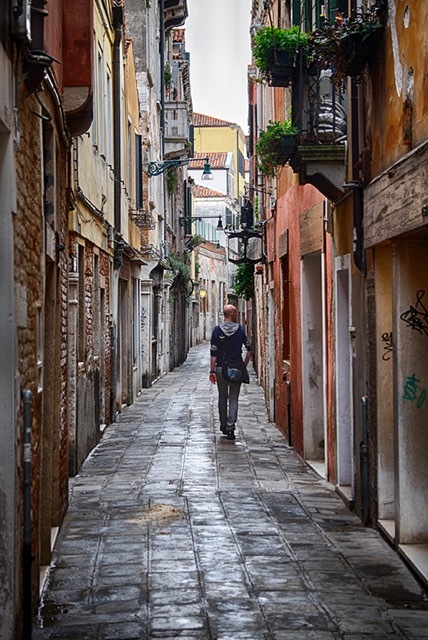 Louise Shoemaker – A Solitary Stroll—I wandered off the edge of the map and got thoroughly lost in a neighborhood far from the busy tourist streets of Venice, and came back with this. It reminds me that every photograph doesn’t have to be extravagant or dramatic. It speaks to me because it is understated and quiet, and it evokes that part of Venice where residents simply live their lives. 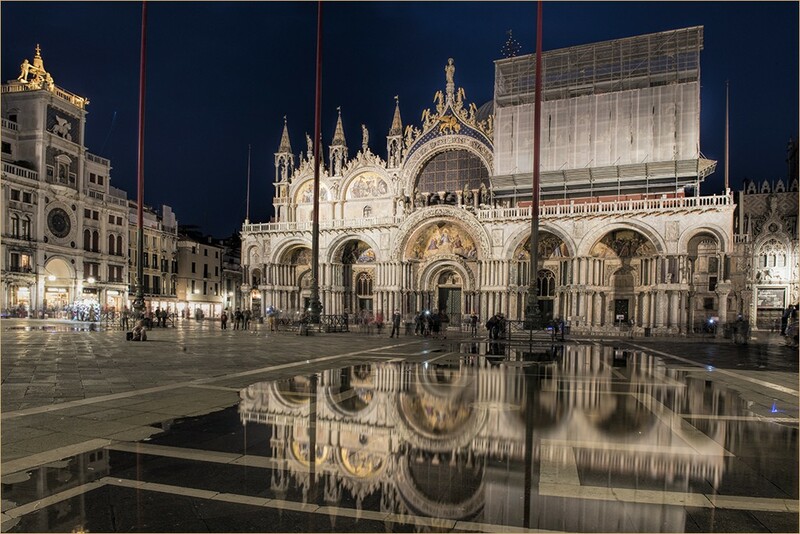 Linda Russo – This image of St. Marks Basilica, in the Piazza San Marco, I like in particular because I’m not familiar with night photography and quite honestly I was surprised that I captured what I saw in my camera’s viewfinder. My Nikon D810 camera was on the tripod and during the long exposure, my friend Linda K and I had to block people from walking in front of the camera. I took multiple images, but this one I like best. The reflection in the puddle of water adds balance to the composition and creates a more dazzling image. I think this one is a keeper! Pat Sweeney – This stands out as my favorite for two reasons: It speaks ITALY to me with it’s vivid color, it’s agelessness and it’s food. 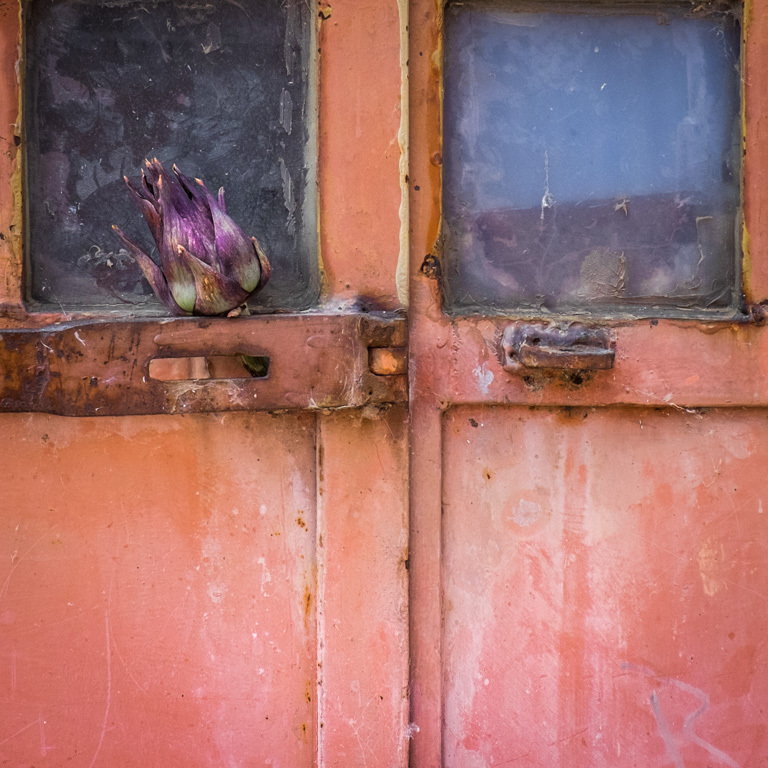 Secondly, working in soft focus (Fuji XT-1 in-camera) as well as square format was a new experience. Stepping out of the box was challenging and lots of fun! 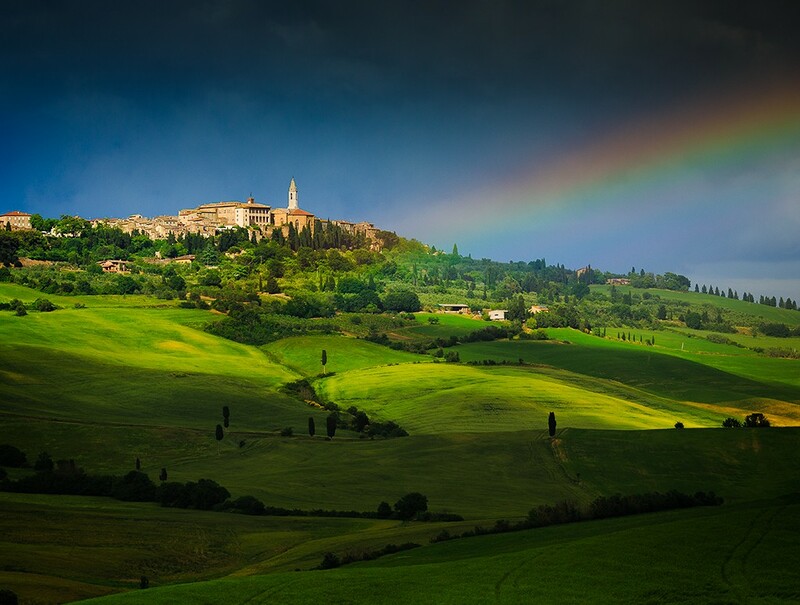 Robin Harrison – She told me she was especially fond of the two rainbows we were treated to on this trip and thus this is one of her favorite memories. Dan Sniffin – Co-Tour Leader – I can’t say that this is my “favorite” image from our tour. But I know that the simpler the subject is, the easier it is for a viewer to understand the intent of the maker. 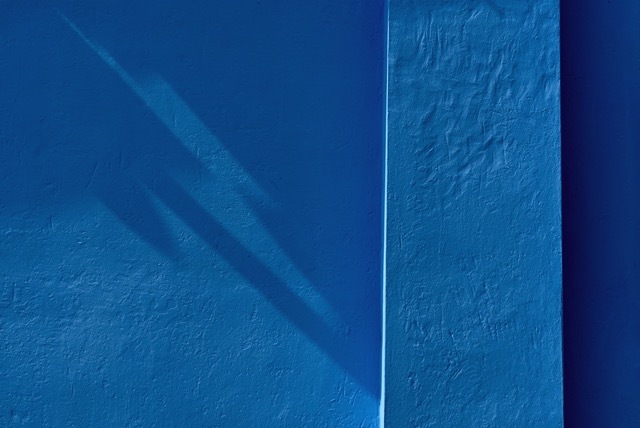 Here, it is easy to see that this is a study of color, textures and shapes, with the shadows adding a strong serendipitous element.